Buying a kegerator is not only about storing your drinks; it’s also about saving on drinks. You can save up to 40-60% in costs. It’s simply because bulk buying is thriftier than having to purchase in small amounts. You don’t have to worry about excess beer going bad because that’s just what a kegerator is for. It’s basically a win-win situation. 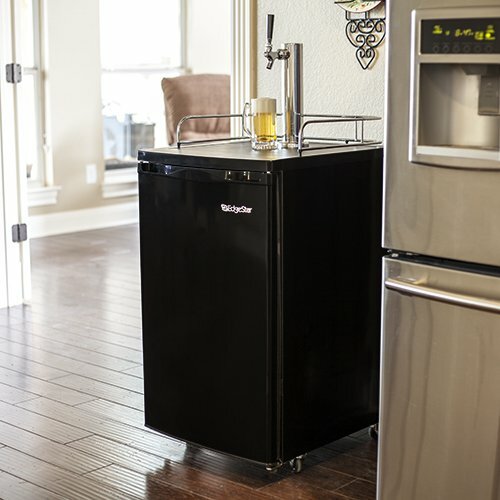 Mini Kegerators: If you have a limited space or want something light, this is for you. It can hold 5-liter kegs (10-13oz bottles worth) and you can bring this to small gatherings or parties if you want. A kegerator that can be integrated into the kitchen counter. If you want to own a mini bar-rescue appliance, I highly suggest you go with the latter option. Commercial Kegerators: As its name implies, this is more suitable for commercial use. This is for restaurant and bar owners who want to include draft beer among their list of drinks. 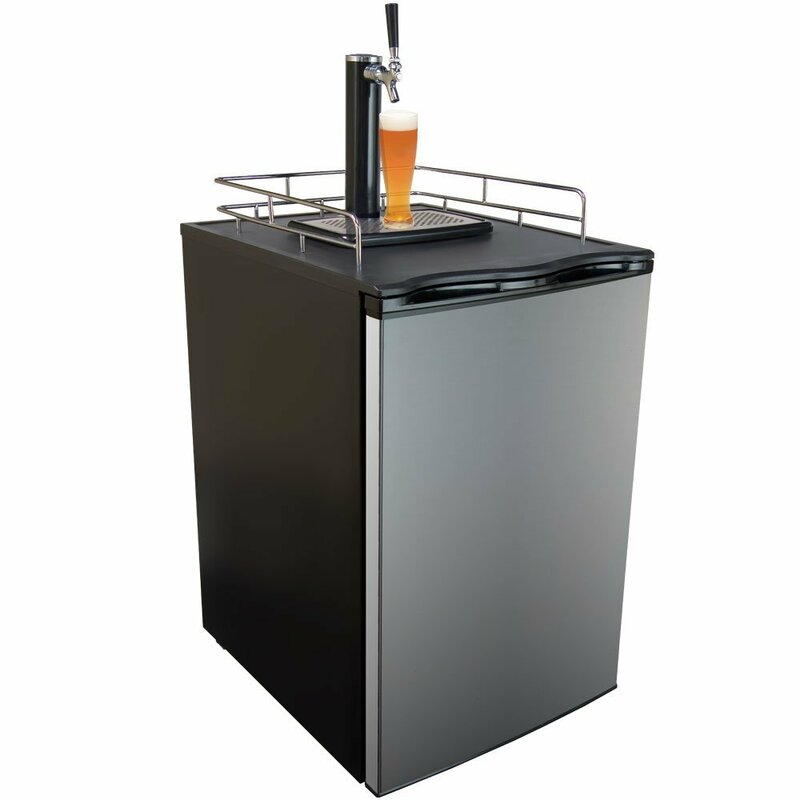 Outdoor Kegerators: Now, this is for people who are constantly outdoors or lives outdoors. This type of kegerator is the only one allowed to be used outside due to the difference in build and insulation. This helps better regulate the temperature of the draft on warm days. In order to answer that, you have to understand what you want in a kegerator first and who you are as a person. If the price is a concern for you and you’re pretty handy with tools, I would recommend D.I.Y. This is an advantage for people who want to customize their kegerators. However, if you want an outdoor kegerator, building your own might not be possible. For people who find it difficult to put what into where I would suggest getting a store bought a kegerator. It’s ultimately better to be safe than sorry. Although in the end, a D.I.Y is almost as costly as an affordable store-bought kegerator. The difference is you get to customize it to your liking and preference. Before buying a kegerator, you might want to consider the benefits and drawbacks of owning this appliance; first of all, the advantages of a kegerator- obviously, you will be able to drink as many as you want. Other than that, bulk-buying is thriftier in the long run than buying in small amounts. Kegerator keeps your beer fresh as long as you want. Lastly, being able to drink all you want in the comfort of your home. What could be better than that, right? Now that you decided that yes- kegerators are worth it, the next things to think about are the important factors to consider when choosing the best kegerator for home and for your space. First of all, know your house and your space. Earlier on we mentioned different types of kegerators. Make sure to understand the limitations of your space inside the house to get the best kegerator for home use. If space is not an issue, the next thing to consider is how many would you like to store in your kegerator. Know how much you can consume to avoid any wastage of beer. Can you afford it? The bigger they get, the more expensive they are. So consider your budget when choosing. Also, make sure to research the size of the product that you will store in the kegerator to understand better which type is perfect for you. As mentioned before, consider your budget, not only for buying or making the kegerator but also for the maintenance, cleaning and energy costs. Some kegerators have dual or three taps. This is when you want to have different types of beer stored in your kegerator. If you prefer that one type of beer then a single tap kegerator will do. It goes without saying that you have to purchase an appliance that will last hopefully for years. When kegerators are bought, it comes with a warranty. Make sure to choose a product that provides a good warranty. A kegerator works due to the pressurized carbon dioxide that allows the beer to be dispensed evenly at any time. Through gas pressure, the beer is forced through the faucet from the keg. But before that, we should know first how to assemble a kegerator. Here is a video tutorial for a step by step procedure. Cleaning your kegerator is important because poor maintenance could result to a bacterial infection. This may change the quality of the beer. Proper maintenance is also important in making sure to prolong the storage of the beer. You can have this for a price of 499 dollars which is pretty okay compared to Versonel. This also has an external mount for the tank and can be converted into a refrigerator. It also has 4 inches less in width but same interior capacity. You can still fit one regular size keg in there but C﻿oor﻿s/Miller kegs are still not suitable. The greatest thing about this kegerator is that it reaches up to low the 30s for the temp level and what we want is a really good ice cold beer right? Another thing is that it has a dual tap system which offers variety for your drinks. However, there is one problem. This might not be the best kegerator for homebrew. If you're a home brewer, this has only standard connectors which are unfortunately not compatible with corny kegs. Good thing, though, it’s very easy to have them replaced. For home brewers, connectors are not compatible with corny kegs. Coors/ Miller kegs won’t fit. Versonel has a much more expensive kegerator but certain features make up for it. You can buy this unit for $559.99. If you're having a hard time trying to figure out the temperature level your kegerator has, this feature will definitely be beneficial to you. This product has a digital quick view front temperature display. You can convert this to a standard refrigerator. There are two internal wire shelves to make organizing your beer bottles easier. 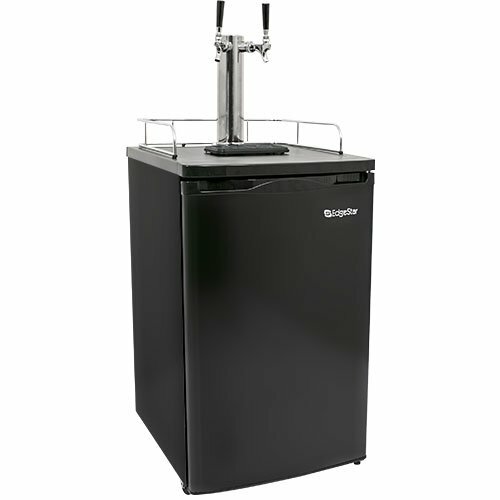 Given the fact that this is a bit more expensive than other kegerators, having an awesome design makes up for the price. But, you can only have one type of beer on tap. Another problem is the setting for the CO2; however, this is a known problem not just with this product. Setting up a kegerator is not an easy task. I recommend that you set the CO2 low first then turn it up higher later on. Edgestar is known for their kegerators which have a relatively good feedback from customers. This particular unit is highly recommended. It has a pretty neat price of only 429 dollars. This kegerator can fit one full-size keg. Although, it also doesn’t support the use of Coors, Miller, rubberized or other oversized kegs. It can maintain low temperatures (low 30’s.) This unit is for freestanding use only but it has casters which are used to move the kegerator. 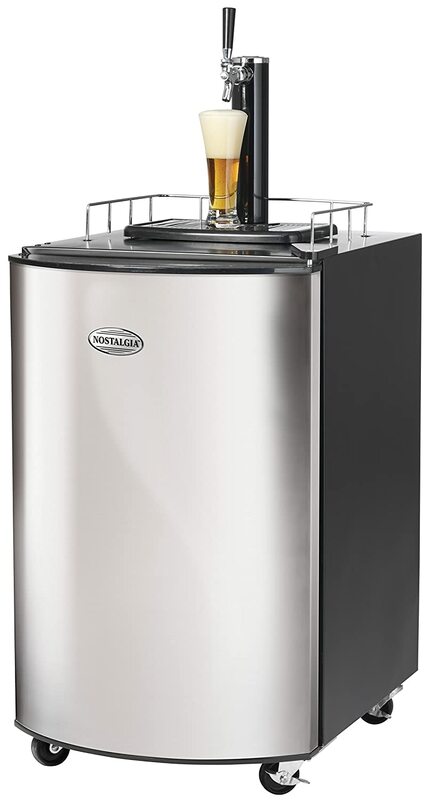 A great advantage is the fact that you can easily convert this kegerator into a refrigerator. Like Nostalgia, it also has a drip tray to catch any spills. This unit can be bought in either a black or stainless color. Regarding its width, it’s 4 inches less than a standard kegerator but it can still fit one regular size keg. Its CO2 tank can be placed at the back of the unit which allows more space inside the appliance. EdgeStar offers 90 days warranty for labor and one year for the parts. However, this unit has only a single tap feature and the CO2 containers have the lead. I highly advise that you wash your hands when handling the tank and avoid any internal contact. Easy conversion to the refrigerator. This is a bit more expensive than Nostalgia with the price of $419. Like the previous two kegerators, this can also fit one full keg. Although this one has only one tap, hence you can only have one type of beer for your kegerator. This unit has a sleek design. It has a black matte exterior that complements anything and everything. Unlike both Edgestar and Nostalgia, you can fit Coors light or Miller light kegs. Customer service must be contacted when requesting the warranty. The only problem with this product is the temperature level. However, this can be resolved by installing a fan. This kegerator is for everyone who wants a budget-friendly kegerator. For a price of $379, you can have your own kegerator. It has a 5.1 cubic foot capacity which can fit one regular-sized keg. It also has a dual tap feature which allows you to store two kinds of beer. 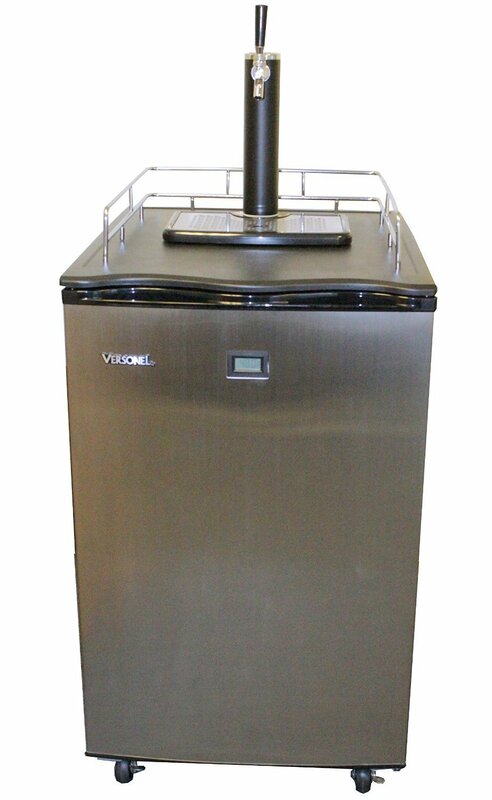 For an easy clean up, this kegerator has a stainless steel removable drip tray. Nostalgia KRS2150 has four casters which make it easy to move it around. Warranty is not stated but you can contact their customer service to ask for more details. Although, there are downsides to this appliance; if you're a fan of Coors light beer- I’m sorry but a Coors light keg won’t fit inside this kegerator. There are also issues regarding temperature adjustment. It can only go as low as 45-40 Fahrenheit. It is cold enough but for some, it may be not enough. An additional hose is also required to prevent excessive foaming. The regulator could also be better to prevent any gas leaks. A hose and a regulator are not that pricey. So if you’re really looking for something affordable this is highly recommended for you. Looking at the pros and cons, it’s a bit of a tough choice. They have their charms and flaws so let's review what we want in a kegerator. We want a price that works for us. We want something durable of course. Some people want only one type of beer, while others prefer variety. 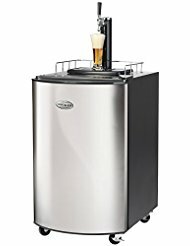 For me, the top rated kegerator is EdgeStar Full Size Dual Tap Kegerator & Draft Beer Dispenser. This product has just the right price. It has a dual tap system. It has almost zero problems and complaints. Also, Edgestar offers the great warranty. Compared to the first Edgestar, this one offers more diversity with its double tap configuration. Nostalgia may be budget friendly but you’ll have fewer issues and spend less on upgrading parts if you pick this. Keggermeister, on the other hand, has a single tap system and temperature issues. Versonel is expensive and a digital temperature display is more of a luxury than the necessity. If you're looking for a kegerator that is practical and perfect for you then this product is highly recommended.